Welcome to the Tarkio Presbyterian Church. Sunday School begins at 9:30 a.m. in Filson Parlor. Sunday Worship begins at 10:45 a.m. followed with juice and coffee in Filson Parlor. The central focus of our faith is gathering to worship God. “Anyone who follows me shall not walk in darkness.” These are the words of Jesus Christ….Let it be the most important thing we do, then, to reflect of the life of Jesus Christ.To love God and serve only him. Children are welcome in worship. Children’s activity boards are available at the entrance to the sanctuary. A nursery is available during worship for infants, toddlers and preschool age children. Parents may wish to have their young children stay for the “Children’s Message” before leaving for the nursery. Presbyterians practice “open communion” which means that all baptized Christians are invited to participate in the Lord’s Supper on Sundays in which it is celebrated. Baptized children who are being nurtured in the faith are also invited to receive the Lord’s Supper recognizing that their understanding of the sacrament will vary according to their maturity. We have a public Facebook Group. 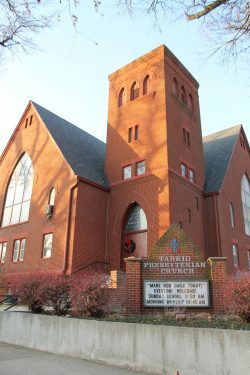 Search or click here: Tarkio Presbyterian Church to join in the discussions.